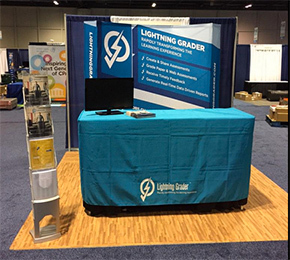 For the second year in a row one of Cleveland’s coolest companies, Lightning Grader, is exhibiting at the Florida Educational Technology Conference in Orlando Florida. The Florida Educational Technology Conference is the second largest (depending on who you talk to) educational technology conference in the country, only behind ISTE and to most, tied with TCEA. Over 10,000 educators will hear keynote presentations, experience learning labs, work sessions and of course, see the latest technology in their exhibit area. Lightning Grader, and their parent company Learning Egg were recently named one of Cleveland’s Top 25 Coolest Tech Companies. They’re also a proud member of the Youngstown Business Incubator, The #1 University Affiliated Business Incubator in the world. With all that in mind though the most important thing is how Lightning Grader got to marker and to FETC 15. Elijah Stambaugh is one of a handful of great educators turned founders who discovered the need for Lightning Grader when he was himself teaching middle schoolers. Grading is such a pain point with teachers, but also an extremely important piece of the educational matrix that it needs to be handled both quickly and correctly. LightningGrader isn’t just about A’s and B’s or a percentage grade though, Learning Egg has given the Lightning Grader user the ability to deep dive into over 15 different macro level reports to see the big picture and the best way to handle a students progress. Teachers are able to quickly grade assignments and recall that data in a number of ways to help it make sense to the student and the parent. After a career on a GM assembly line Stambaugh found himself staring down the face of a buyout. The buyout gave him the opportunity to pursue teaching, something he had wanted to do his whole life. But as with many professions he only saw one side of the picture as he headed into a Youngstown Ohio classroom. That’s where he found out how much time was involved in teaching and the rest on doing administrative work. ]”Learning the realities of teaching, mainly standardized tests, politics and very little time left for teaching, Stambaugh was inspired to conceive the idea of Lightning Grader as a software platform.” Cleveland.com reported. Of course the purpose of the trip to Florida was to show off the benefits of LightningGrader, the biggest being that teacher’s can get back to teaching and have data they can trust and rely on. This is a great concept! Having graded papers myself…this startup has hit on a huge part of educating students, informing parents and supporting teachers.